One of the many joys of female friendship is serving as your bff’s bridesmaid on her wedding day. If you’ve been asked to take part in a fall wedding, you’ll want to start researching fall bridesmaids dresses you can stand to wear all day while the flashbulbs go off. Bridal trends, like any fashion trends, shift with the seasons. For autumn dresses, think rich tones, structured silhouettes and heavier fabrics that are perfect for the cooler temperatures. To help you out, we’ve compiled a selection of our favourite fall bridesmaid dresses to suit a variety of body types and personal preferences. The best part? 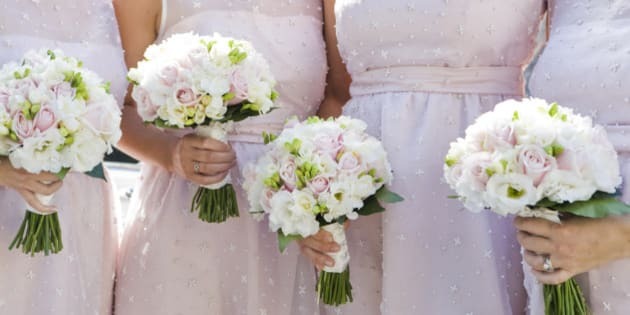 You can definitely wear these dresses over and over again without looking like the maid of honour. A beautiful black tie wedding calls for a bridesmaid dress that exudes class and elegance. The Annabelle dress by BHLDN hits both marks, featuring a stunning bias cut design that can be styled 15 ways. The Parker Shirley dress is an ideal bridesmaid dress for an art-deco themed wedding. This shimmery fringe frock has potential for multiple wears. We can just picture the bride’s team of flapper-esque bridesmaids sashaying down the aisle in time with the fringe. You can’t really go wrong with an elegant lace sheath dress, especially in a bold jewel tone like this one by Tadashi Shoji. The other bridesmaids will thank you for selecting this ultra flattering design that creates the illusion of a svelte waist. The Reformation bridal collection is not only environmentally friendly but the brand also creates out-of-the box designs all the cool brides are wearing. This rich merlot-hued dress is the perfect shade for fall and the long sleeves will prove handy when it starts to get chilly. If the bride isn’t clamouring to wear this retro inspired dress, the bridesmaids will. The cream coloured frock features a gathered bodice that exudes old school elegance. The trend of black bridesmaid dresses continues to grow, and we can see why! This cap-sleeved LBD by Halston Heritage would contrast beautifully with the bride’s white gown. Nothing says fall more than luxurious brocade. We love this rich purple pleated dress for a chilly October wedding. The price tag isn’t too shabby either. Navy seems to be the favoured hue of the fall season. This quaint bridesmaid dress from Amsale is truly a dress you’d be keen to wear again. We especially love the bow around the neck for a retro look and feel. Designer Lela Rose is known for her feminine aesthetic and her bridal line doesn’t fail to transport us to the ultimate fairy tale wedding. Take this tea length pearl pink dress that features a contrasting black lace overlay on the bodice. Perfection? We think so. Unlikely place to find a bridesmaid dress? Not really. Mango often stocks beautiful formal gowns for any occasion. We would love to see a couple of happy bridesmaids clad in this easy going floral gown that includes a matching belt to cinch in that waist. Velvet has its detractors but this undeniably chic velvet midi dress would make for the perfect fall bridesmaid dress. The off-the-shoulder design and tailored fit offers a classic silhouette you’ll only look back at with fondess. If an out-of-the-box bridesmaid dress ever existed, it would be this one by San Francisco-based designer, Byron Lars. The warm fall hues and mishmash of patterns and fabrics strike a surprisingly ideal balance. You’ll inspire future brides to forgo the generic solid coloured bridesmaid dress once they see this one in action. Canadian designer Lucian Matis offers bridesmaid dresses with a little twist. The pastel purple might be characteristic of the traditional bridesmaid dress but the mermaid style silhouette gives it that little extra punch. If the bride is concerned that the bridesmaids will steal the limelight, don’t pick this dress by Kate Spade. The only thing better than the front view of this flared red mini dress is the open back and dramatic bow. The adorable photo ops are endless with this dress. Not every bridesmaid is built the same. In fact, odds are all the ladies in waiting won’t look good in the exact same dress. We’re so thankful someone came up with the concept of convertible dresses like this lovely silver midi dress from Henkaa that allows you to adjust the neckline, waist and back in endless ways.